Located in Kissimmee, Gaylord Palms Resort & Convention Center is in the suburbs, within a 15-minute drive of Celebration Golf Club and Disney's Animal Kingdom® Theme Park. This 4-star resort is 5 mi (8 km) from Disney Springs® and 5.7 mi (9.1 km) from Epcot®. Make yourself at home in one of the 1416 air-conditioned rooms featuring refrigerators and Smart televisions. Cable programming provides entertainment, and wired and wireless Internet access is available for a surcharge. Private bathrooms have designer toiletries and hair dryers. Conveniences include phones, as well as laptop-compatible safes and desks. Pamper yourself with a visit to the spa, which offers massages, body treatments, and facials. You're sure to appreciate the recreational amenities, which include 2 outdoor swimming pools, 2 spa tubs, and a complimentary water park. Additional amenities at this resort include complimentary wireless Internet access, concierge services, and babysitting/childcare (surcharge). Spending a day of fun is easy with the complimentary theme park shuttle. Grab a bite at Old Hickory Steakhouse, one of the resort's 6 restaurants, or stay in and take advantage of the 24-hour room service. Snacks are also available at the 2 coffee shops/cafés. Relax with a refreshing drink from the poolside bar or one of the 2 bars/lounges. Breakfast is available for a fee. Featured amenities include a business center, limo/town car service, and express check-in. Planning an event in Kissimmee? This resort has facilities measuring 406662 square feet (37780 square meters), including a conference center. Self parking (subject to charges) is available onsite. 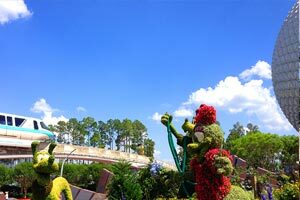 The preferred airport for Gaylord Palms Resort & Convention Center is Orlando, FL (MCO-Orlando Intl.). All taxes and fees are included in the room rate for any reservation where payment is made at time of booking.